Universal Transceivers significantly reduce the total amount of optics needed in stock. With the unique ability to tailor transceiver interoperability for almost all major and niche systems, there is just no need to build a large inventory of different vendors. Network builders just keep sufficient Universal Transceivers regardless of different system vendors deployed in the network. In heterogeneous networks, this can save a lot of money and headaches. This is true for deployment preparation as well as for spare parts. Tunable transceivers even take this to the next level and reduce the stock e.g. of DWDM optics to a fraction, since wavelengths can be defined on demand. However – with FLEXOPTIX having an immense stock in Europe, ready to deliver the next day – even ordering everything on the fly is an option. One day we received this picture via WhatsApp from INEXI0, one of our customers. It took just a second, to realize what this picture had to say. 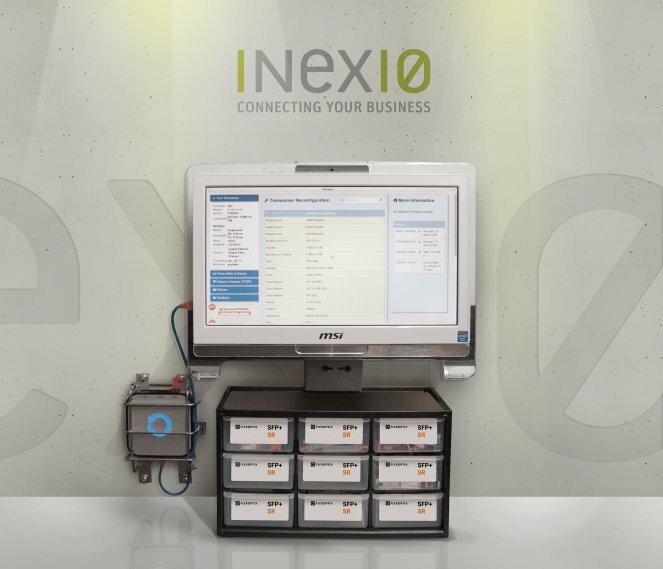 It portrays our FLEXBOX, connected to an all-in-one computer, thus turned into a Universal Transceiver Configuration Station. There are just a few drawers for different distances and form factors, that's it. No line-up for each and every vendor. No box with spare transceivers matching devices that have long been obsolete. And no stool to reach the far most upper corner of a transceiver shelf. We were fascinated. Not only were we surprised at how someone turned our FLEXBOX into a full-featured Transceiver Station/Dispenser, which is a great idea, but also to see a real live example on how little storage you actually need, if you deploy Universal Transceivers. So Sven, our sales manager, went over to see everything in action and talk to Stefan Kreibig, who built the station. We really like your Configuration Station. Since when are you deploying FLEXOPTIX hardware? It all started in the beginning of 2014. Back then we always kept a transceiver of every type in store, for every single vendor. Often, we had no use for them anymore, but kept them anyway, 'cause you never know, right? Before switching to Universal Transceivers, it often took vendors some time to ship their transceivers. We had to plan in advance and it was hard to tell, whether transceivers would be here in time. With FLEXOPTIX, we enjoy incredibly fast deliveries. It usually takes less than three days until we have our optics. So now we can focus on other things. What improvements where made with Universal Transceivers? Since we deploy FLEXOPTIX Universal Transceivers solely, storage space shrunk and logistics now come at ease. Have you ever thought about switch back to vendors' original optics? We enjoy the benefits of Universal Transceivers and we had good experiences in the long run. So we will continue to deploy them. But it's not just about hardware. The people over at FLEXOPTIX are helpful and competent. When we find ourselves in non-standard situations, we team up to find a fast and optimal solution together. It is really fun working with you guys!